Aside from a darkly comedic tone that may shock viewers into the occasional dubious chuckle that's helped along by the fact that Nurse Jackie is presented to us in a sitcom friendly twenty-two minute format, there's not a whole lot about Showtime's latest smash that would lead you to immediately place it in the comedy genre. Yet just like Glee manages to work enough attitude and pathos into the musical surface to make its comedy bittersweet and even Modern Family 's humor is more understated and relatable rather than ha ha hysterical, sure enough Jackie joined the ranks of the other programs as Emmy winning comedies at the recent 2010 award ceremony. And perhaps it's a testament to the truism that ultimately instead of just a convenient laugh track cuing them where to chuckle, what attracts people first and foremost to tune in is the quality of the stories being offered to viewers in shows that don't fit into any traditional box. Likewise and Jersey Shore audiences aside, possibly we've grown so sophisticated that we understand that life isn't any one thing at any specific time or that even in our worst moments, there's something bizarrely humorous going on and vice versa. It's the possession of this attitude or the willingness to accept the sweet and the sour or the pain and the pleasure simultaneously that is vital for appreciating Showtime's newest female-driven series. By ignoring the sanctimonious speechmaking style witnessed on Grey's Anatomy along with the very special episodes of gunmen in the hospital on E.R. in favor of taking us to the intersection of life and death, drama and comedy, heartbreak and hilarity and sanity and lunacy, Nurse Jackie breaks the mold. Given not only its unabashedly daring decision to make us identify with a female nurse as opposed to network TV favorite male doctors, series creators Liz Brixius, Linda Wallen and Evan Dunsky take it even further by making our protagonist an antihero whose behavior alternately infuriates and inspires us throughout the twelve episode first season. While we all expect Kurt Sutter's bikers of SAMCRO to be ex-cons on FX's Sons of Anarchy , we're not all that familiar with seeing someone in a helping profession – especially when that person is a woman, wife and mother – embrace their dark side quite as easily as Sutter's outlaws do week in and week out. 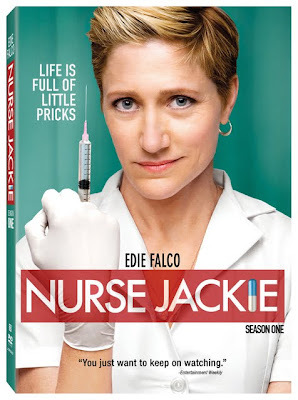 Although Edie Falco's Nurse Jackie cares strongly about her patients so much so that she's willing to overlook ethics and laws to ensure that they get the very best care possible, our healer is also a patient herself, self-medicating to the point of frightening narcotics abuse to ease her chronic back pain for fear of becoming unemployed. A high functioning addict who's scarily able to hide evidence of her drug dependency from her coworkers including her doctor ally O'Hara (Eve Best), new nursing student Zooey (Merritt Wever) and others, Jackie leads an even more complicated dual life by pretending she's single at work regardless of the fact that she's a married mother of two at home. Throughout, her motivations constantly confuse us as to whether she's simply private, needs to compartmentalize her two different worlds in order to work and live by keeping them separate or if it's all a greater level of manipulation since Jackie cheats with the hospital pharmacist (Paul Schulze) for the benefit of meaningless sexual release as well as pill handouts he shares with her for her back. While traditional hospital drama including a few outrageous cases help fuel each episode, there's always a stronger second line of plot at play as Jackie works overtime to avoid being found out as her various roles and existences overlap and come close to getting pushed out into the open. Although it isn't traditionally funny, in the amazing pilot directed by Sopranos veteran Allen Coulter, I became instantly aware that much like Curb Your Enthusiasm , Jackie is at its best when everything just clicks into place as not a line of dialogue, question raised or ironic counterpoint is wasted in a pilot that's so tightly written, directed and edited that it should be studied. And considering the twelve episodes contained in the three disc DVD set, it's easy to appreciate how memorable the series is for the way that it places its emphasis on story over simply stacking up the dominoes of drama to overwhelm us a la medical dramas like Mercy , Hawthorne and Grey's Anatomy or by emphasizing the wacky side of the profession as seen in Scrubs and Royal Pains . While even the compulsively watchable Falco isn't terribly certain what fuels her impossible to pinpoint character from time to time, we understand that despite our resistance to identify with such a troubled individual because we hold nurses up to such a high level of professionalism, Jackie's complex flaws are what keep us riveted. As the result of continually blurring the lines between what makes a hero or a villain, Jackie has become one of the most psychologically fascinating female characters currently on television and likewise one that’s so engrossing, plotlines could be derived because of her personality even without the hospital setting. With this in mind, Jackie’s Jackie is right at home on the pay cable channel that also boasts one of the most talked about TV male characters as well in the form of Dexter ’s Dexter played by Michael C. Hall. Similar to the fact that sometimes you need more than one prescription to treat what ails you, Showtime’s intellectually stimulating series simultaneously blends that which makes us laugh along with things that make us cry to produce a potent TV cocktail with addictive side effects.